When in Brisbane, make a side trip to see Warner Bros. Movie World in Oxenford, approximately 1h 20 min away. 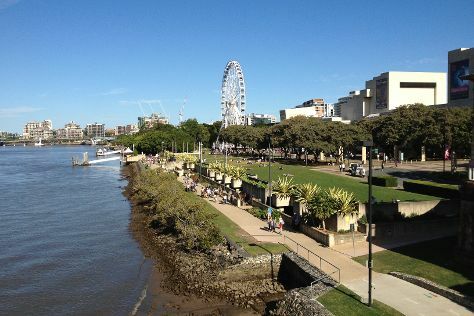 There's still lots to do: let the kids burn off some steam at South Bank Parklands, find something for the whole family at Wheel of Brisbane, admire the natural beauty at Roma Street Parkland, and get great views at Mount Coot-tha Lookout. To see more things to do, reviews, traveler tips, and more tourist information, go to the Brisbane trip planner . If you are flying in from Australia, the closest major airports are Brisbane International Airport and Gold Coast Airport. In April, daily temperatures in Brisbane can reach 30°C, while at night they dip to 19°C. Finish your sightseeing early on the 25th (Sat) so you can travel to Montego Bay. Venture out of the city with trips to Reggae Style Mayfield Falls (in Savanna La Mar), Tryall Golf Course (in Sandy Bay) and Original Mayfield Falls Jamaica (in Pennycooke). Next up on the itinerary: steep yourself in history at Rose Hall Great House, view the masterpieces at Ahhh...Ras Natango Gallery and Garden, take in the architecture and atmosphere at Blessed Sacrament Cathedral, and explore the galleries of Greenwood Great House. To see reviews, more things to do, traveler tips, and tourist information, refer to the Montego Bay tour itinerary planner . Traveling by flight from Brisbane to Montego Bay takes 27 hours. Alternatively, you can do a combination of flight and bus. The time zone difference when traveling from Brisbane to Montego Bay is minus 15 hours. Expect a bit warmer temperatures when traveling from Brisbane in April; daily highs in Montego Bay reach 37°C and lows reach 28°C. Finish your sightseeing early on the 28th (Tue) so you can drive to Negril. Kick off your visit on the 29th (Wed): fulfill a lifelong dream with a swim-with-the-dolphins experience, pause for some serene contemplation at Mary, Gate of Heaven Catholic Church, and then kick back and relax at Seven Mile Beach. Here are some ideas for day two: gain some tasty knowledge on a distillery tour, stop by Irie Art, and then tour the pleasant surroundings at Bloody Bay. To find where to stay, other places to visit, photos, and other tourist information, refer to the Negril trip planner . You can drive from Montego Bay to Negril in 1.5 hours. Alternatively, you can take a bus. In April in Negril, expect temperatures between 37°C during the day and 28°C at night. Finish up your sightseeing early on the 30th (Thu) so you can go by car to Saint Elizabeth Parish. Ecotourism and beach break activities dominate most Saint Elizabeth Parish itineraries, as this wild and relatively undeveloped region offers a wealth of natural environments. Kick off your visit on the 1st (Fri): admire the sheer force of YS Falls, then sample the fine beverages at Appleton Estate, and then take a stroll through Bamboo Avenue. To see more things to do, other places to visit, ratings, and other tourist information, you can read our Saint Elizabeth Parish holiday builder site . Traveling by car from Negril to Saint Elizabeth Parish takes 2 hours. Alternatively, you can take a bus. 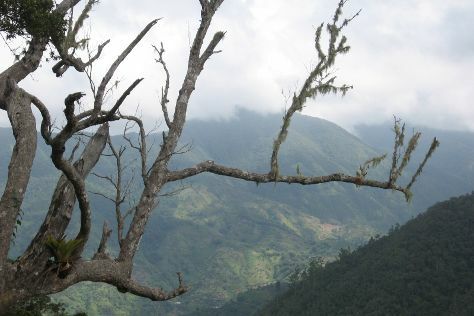 April in Saint Elizabeth Parish sees daily highs of 37°C and lows of 28°C at night. Cap off your sightseeing on the 1st (Fri) early enough to go by car to Ocho Rios. Get out of town with these interesting Ocho Rios side-trips: Green Grotto Caves (in Runaway Bay) and Bob Marley's Mausoleum (in St. Ann's Bay). There's much more to do: admire the sheer force of Dunn's River Falls and Park, pause for some serene contemplation at Our Lady of Fatima Catholic Church, kick back and relax at Bamboo Beach Club, and stop by Jewels & Time Duty Free Jewelers. To see maps, reviews, other places to visit, and more tourist information, read our Ocho Rios trip itinerary planner. Traveling by car from Saint Elizabeth Parish to Ocho Rios takes 2.5 hours. Alternatively, you can do a combination of taxi and bus; or take a bus. Expect a daytime high around 37°C in May, and nighttime lows around 29°C. Cap off your sightseeing on the 4th (Mon) early enough to travel to Portland Parish. Tourism in Portland Parish has changed focus in recent years. Start off your visit on the 5th (Tue): take in the dramatic scenery at Nanny Falls, then explore and take pictures at Restoration Village Farm, and then take in the awesome beauty at Blue Mountain Peak. Here are some ideas for day two: admire the sheer force of Reach Falls, then kick back and relax at Frenchman's Cove, and then explore the activities along Blue Lagoon. To see where to stay, reviews, other places to visit, and other tourist information, use the Portland Parish trip itinerary planner . Do a combination of bus and taxi from Ocho Rios to Portland Parish in 2 hours. Alternatively, you can drive. In May, plan for daily highs up to 37°C, and evening lows to 29°C. Finish your sightseeing early on the 6th (Wed) so you can drive to Kingston. The country's capital, Kingston offers all the excitement of a lively and storied city, while also housing the services and facilities travelers need to get around and see the rest of the island. On the 7th (Thu), take in the awesome beauty at Blue Mountains and then stop by Reve Jewellery & Accessories. On your second day here, steep yourself in history at Bob Marley Museum, then get outside with Lime Cay, and then take in the architecture and design of University Of The West Indies - Mona. To see maps, where to stay, other places to visit, and other tourist information, go to the Kingston trip maker site . Traveling by car from Portland Parish to Kingston takes 2.5 hours. Alternatively, you can do a combination of taxi and bus. In May in Kingston, expect temperatures between 37°C during the day and 29°C at night. Finish up your sightseeing early on the 8th (Fri) so you can travel back home.